Today, Father’s Day. Yesterday, my birthday. 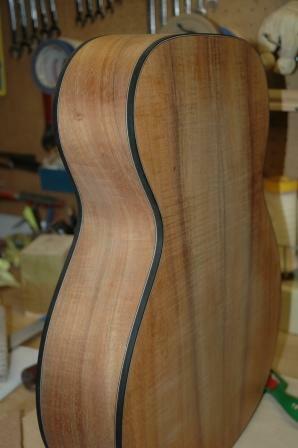 I goofed around with some neck work for unassociated guitars. 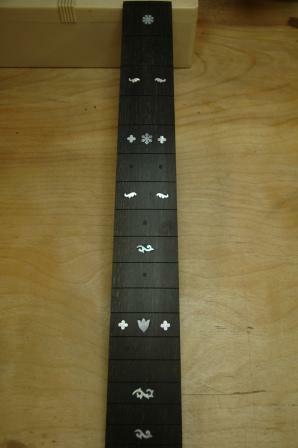 As I was fret marking Beth’s fretboard I continued my tradition of putting the dots on the wrong frets. 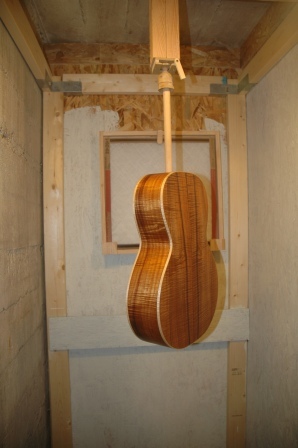 So, I drilled them back out and used the fretboard to practice installing intricate MOP. The picture above is the result. Fretboards these days are coming a bit mottled, so after I apply some blackening agents, we’ll see how this puppy turns out. 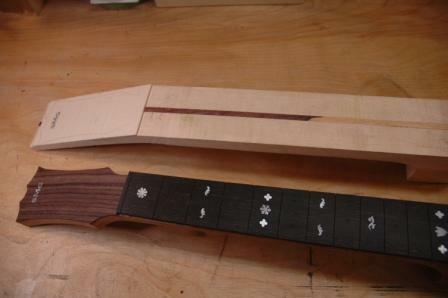 Also put headstock veneer on the neck for the Ovangkol and an unassociated maple neck. I’ve been working but not posting. 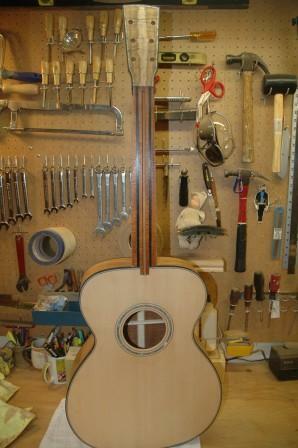 Here’s an update on the progress of the Koa OM for Beth. 1. Binding and Purfling. Had a bit of a mishap with the binding for the back, as the ebony, which was prebent, still cracked severely when installing. Ordered some new ebony and assured the bend was clean, routed out the old cracked crap and reinstalled binding and purfling for the back. 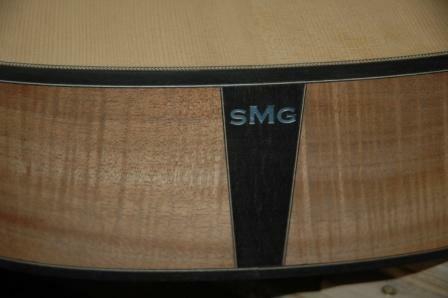 One small repairable crack occurred, and I was able to create a clean binding rim for both front and back. 2. Measured neck angle and found it to be a perfect 90 degrees. Whee. 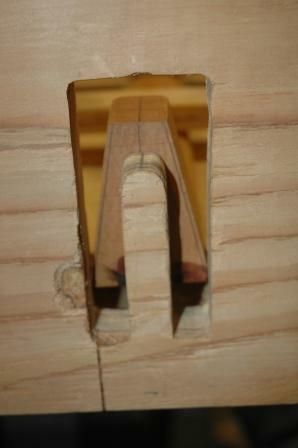 Used tenon jig to cut out tenon. 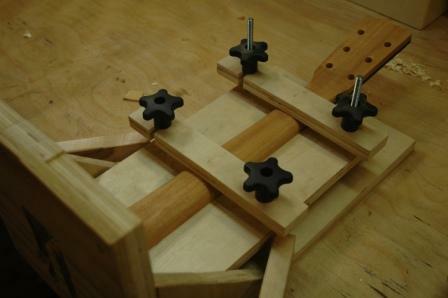 This jig is probably in need of new templates as it’s starting to get a bit chewed up. 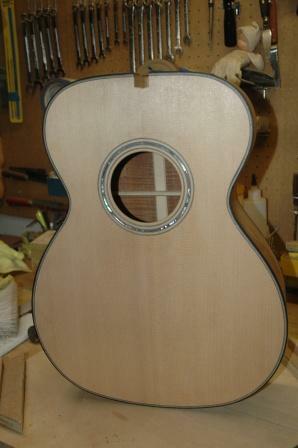 After the cut, dry fit the neck on the body to see the results. 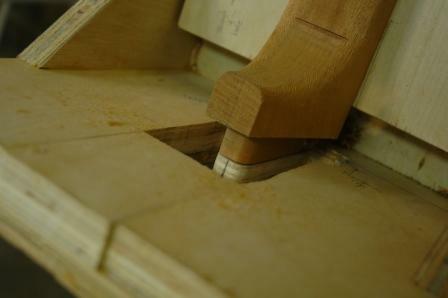 Tenon will be filed to bring neck down flush into mortise, then I will install the neck bolt receivers.